Tue., March 26, 2019, 10:03 a.m. If you don’t know it already, you owe it to yourself to try halloumi, the cheese from the island of Cyprus with the high melting point, meaning you can grill, pan-fry or – as in this recipe – broil it, and it’ll hold its shape. It’s high enough in fat and sodium to make it less appropriate for daily eating, perhaps, but it’s also high in protein, meaning it’s especially good for vegetarians. Bonus: While some traditional European cheeses are made with animal rennet, making them unsuitable for vegetarians, the Mt Vikos brand of halloumi I buy from Whole Foods is made with microbial rennet, which comes from mold. 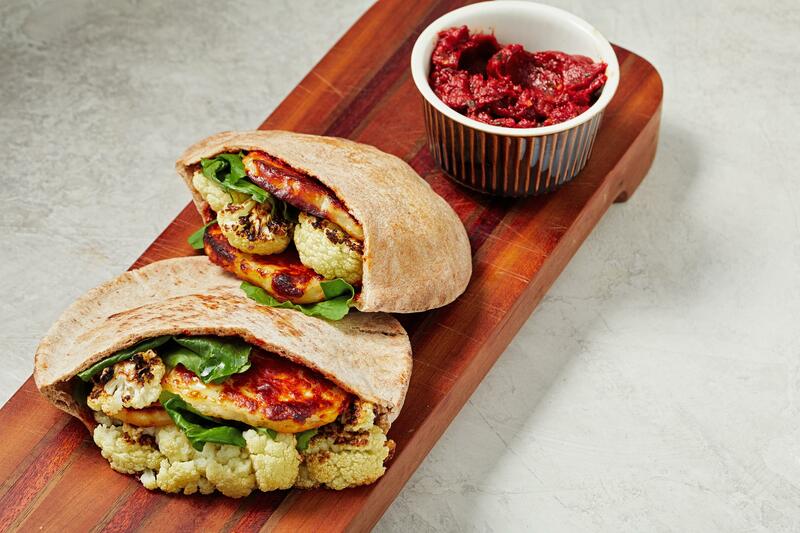 The halloumi, though, is the star. The broiler turns its edges dark and crispy while the interior softens a little but remains slightly chewy – almost squeaky, in the manner of cheese curds. In these sandwiches, it’s what you really sink your teeth into. Position an oven rack 5 or 6 inches from the broiler flame or element; preheat to broil. Line one large baking sheet and one small baking sheet with aluminum foil and lightly brush with oil. Cut the cauliflower head crosswise into 1-inch-thick slabs, arranging them in a single layer on the large baking sheet as you work; It’s okay if you don’t end up with intact slabs on the end, and the florets separate. Rub the cauliflower with 1 tablespoon of the oil then season with the salt and a few grinds of black pepper. Broil until very charred on one side and tender, 10 to 12 minutes. (Don’t turn the cauliflower slabs to broil on the second sides unless they are not quite tender by the time they are charred on the first side.) Timing will vary widely among oven broilers. Published: March 26, 2019, 10:03 a.m.